Sometimes telling someone thank you or saying “I love you” just doesn’t seem like it’s enough. Words are, after all, intangible and ephemeral. While it’s good to say these words, at times it’s even better to back them up with something physical. Show someone how you feel in addition to saying it will really let them know you mean it. There are, of course, many different ways of showing someone how you feel. One of the best ways of showing your feelings is to send flowers. Flowers are especially useful in showing romantic feelings, such as on Valentine’s Day or on an anniversary. They can also be used to show a family member how much you love them, such as on Mother’s Day or by giving flowers to a new mom. One of the nice things about using flowers to back up your words is that they can be appropriate for family members and close friends, but they also work for co-workers or acquaintances. 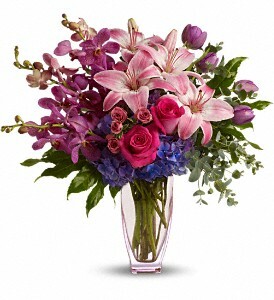 Giving a co-worker flowers for a promotion or for doing an outstanding job is an excellent way of telling them thanks. You can also send flowers to a work acquaintance or someone at another office to thank them for helping you with a project. If flowers aren’t exactly right, how about a gift basket? Sending a basket of gourmet fruits, chocolates, or other snacks can have just as much meaning as flowers. In fact, sometimes these gift baskets are even better than flowers for some people, especially men. While you don’t need to give a gift or show your appreciation with something tangible all the time, every now and then it’s nice to do so. This way, you can re-enforce your feelings with something the person can touch, smell, see, and keep as a memento.